Fossilized tree sap, called amber, is an absolutely amazing substance. It lasts for an incredibly long time, and it has yielded some of the most incredible fossil discoveries of our time. If you need more evidence that amber is a paleontologists’ best friend, look no further than the new paper published today in Current Biology. The study reveals the discovery of an ancient beetle perfectly preserved in tree sap believed to be nearly 100 million years old. 100 million years. It’s a length of time that is almost unfathomable, but there the amber sits with the unlucky beetle still stuck inside. Mother Nature sure is neat. Amazingly, the pristine beetle specimen isn’t even the most exciting thing about the discovery. Near the beetle, inside the thick amber casing, are tiny pollen grains. The small specks are easy to overlook at first glance, but they’re incredibly important for scientists. Scientists don’t know all that much about the plants that covered the Earth 100 million years ago, and they know even less about the habits of the insects that pollinated them. 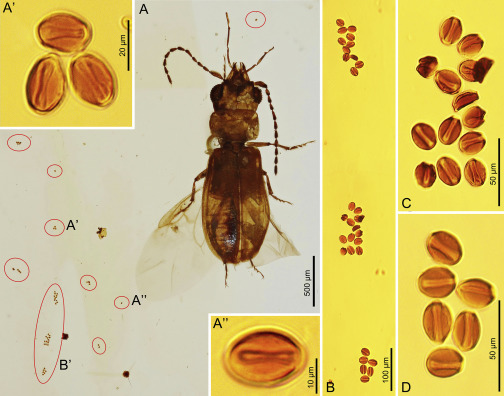 This tiny beetle and its pollen payload are a fantastic window into the ancient world, and it’s providing researchers with a much-needed marking post on the timeline of pollinating insects. It’s long been believed that beetles like this one played a major role in pollinating non-flowering plants for millions of years, and likely preceded the emergence of flowering plants and the flying insects that still help pollinate them today. Catching an ancient beetle “red handed,” so to speak, with collections of tiny pollen grains nearby is an incredible stroke of luck, and the fact that the beetle and pollen are so well preserved is just icing on the cake.